Per AOA: "Highway Man has been a main factor in our black breeding program since we began using him as one of our elite black breeding males. To date 100% of the time when bred to black he has produced…..black! Highway Man has amazing genetics that are not readily available across the United States. His sire is unknown as he was brought into this county inside the uterus of his dam. 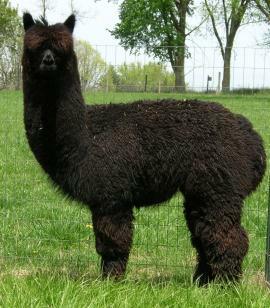 We are so pleased to have him as one of our top herd sires since he is producing some of the best black cria we have seen. Over the years we have placed a number of his offspring into our annual Las Vegas production auction, where we showcase our top production, and have been very pleased with the results. Piedrabuena, Highway Man’s dam, is a medium silver grey who produced two herd sires for us; Highway Man and Strictly Formal. 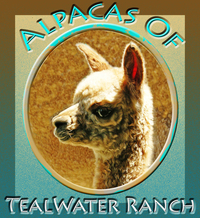 During her breeding career here at Alpacas of America she has only produced black and grey, two of the most highly sought after colors in the industry." 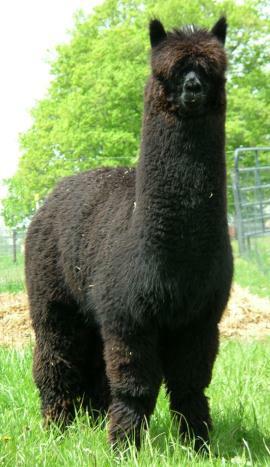 Full Bolivian - Lacey was part of our original starter herd purchase from Alpacas Of America. She has tight, berber dense solid cinnamon colored fleece, and a proud stature with a calm, gentle disposition. Her regrowth is always a marvel. 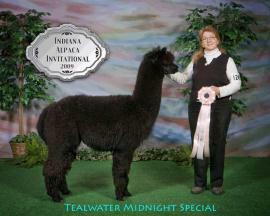 She gave us one of our best true black herdsires, Midnight. She has been bred to Batman to see what she can do with gray genetics, and is due in early October 2010. Midnight is a true black macho with the proud stature and drive of his sire and grandsire, both true blacks. Midnight's dam was part of our original foundation herd hand-picked during a visit to Alpacas of America in Washington state. I had the pleasure of seeing and choosing Highway Man as Midnight's sire. He was an impressive sight, and I chose him hoping to produce a black. Midnight has the same proud stature of his sire and his fondness for the girls! 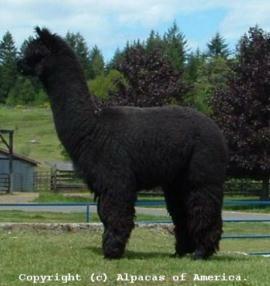 Midnight's dam was sired by another Alpacas of America true black herd sire, an import named Black Thunder, known for his rare color genetics. Black Thunder's offspring are prized for their dense, fine fleece and calm disposition, and he passed those traits on to Midnight's dam, Lacey. 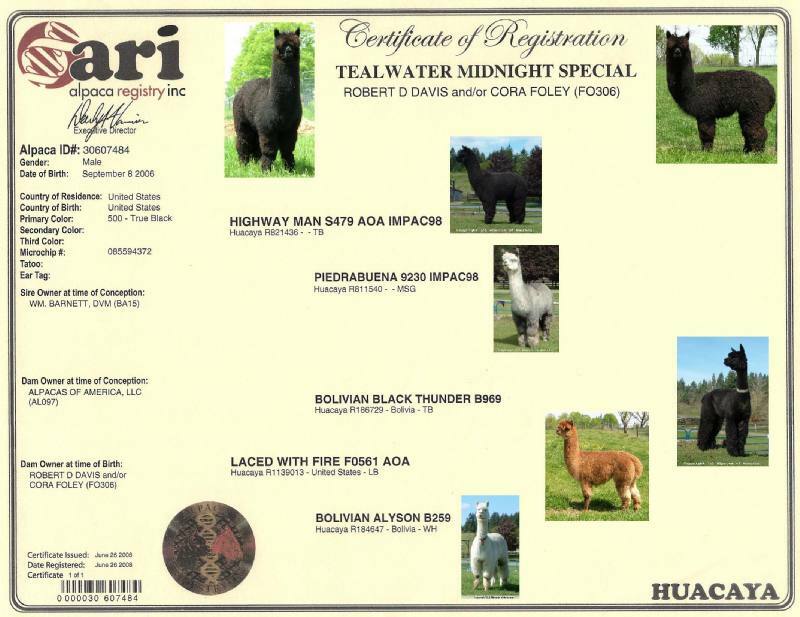 View Midnight's ARI certificate for pictures of his ancestors and all the color genetics he has to offer. 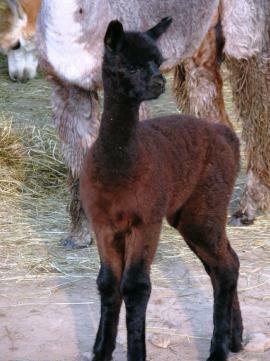 Midnight has produced two cria, first a gorgeous black female named Black Velvet who gave birth to another true black female in 2013. 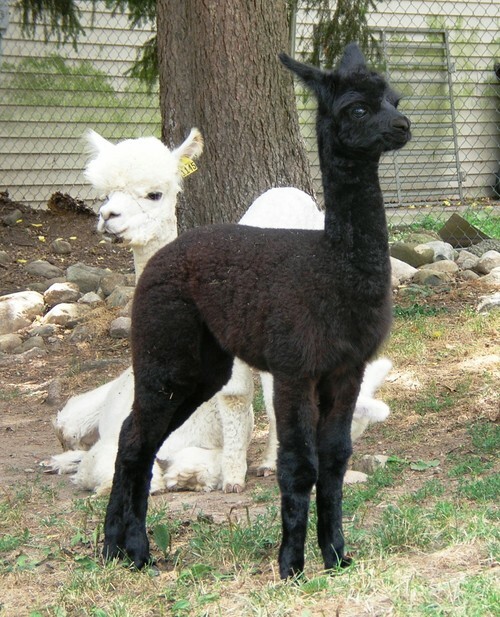 His second cria was another true black, lovely girl, substantial and well-dressed in dense, fine crimped black fiber giving inspiration to the name she goes by: Little Black Dress. This is a very macho male, with dense black fleece and excellent regrowth - with well organized, evenly crimped regrowth. If you're looking for color and genetics closer to those of the original imports, and not widely available in the Great Lakes region, let the Midnight Special shine his ever loving light on your girls!